You can apply for the license plate in person, via mail or online. You can use the same ways to perform Colorado License Plate Lookup as well. You can access the license plate or vehicle information you need using the vehicle’s plate, VIN or title number. The two most common ways to access Colorado license plate or vehicle information are using online public databases and making a request for Colorado license plate lookup to the Colorado Department of Transportation. You can make the request to the Colorado Department of Transportation for the license plate or vehicle information you need in person, via mail, online or over the phone. Now, the other way of performing Colorado license plate Lookup is an incredibly convenient way of accessing the license plate or vehicle information you need. Once you’ve signed up with the online public databases and have the paid the fees, you’ll be able to perform Colorado license plate Lookup yourself. To lookup the license plate or vehicle information you need, all you’ll have to do is enter the VIN or license plate number in the search engine made available by the online database. 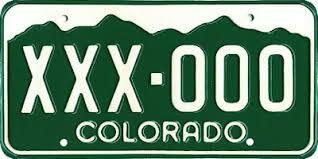 Performing Colorado license plate number lookup with online public databases is that simple! My name is Mary c. Maes I’m now in arizona but will be living back and forth in both states Arizona and Colorado. My plates are due in May which I will still be in Arizona. Please advice me where to get my plates though I would like to continue to have Colorado plates. My Colorado address is 1906 S. Carr st. In Lakewood. Ziggylex @ MSN.com. Will be in Arizona through the summer or for as long as I can stand the heat. Thanks for reaching out. Unfortunately we cannot directly assist you license plate registration since we are not affiliated with the Colorado DMV or the Arizona MVD Offices. That being said, as long as you have a physical address in Colorado you should be able to register your vehicle and Colorado license plate with the Colorado DMV. A link to the Colorado DMV Office is listed below for your convenience.